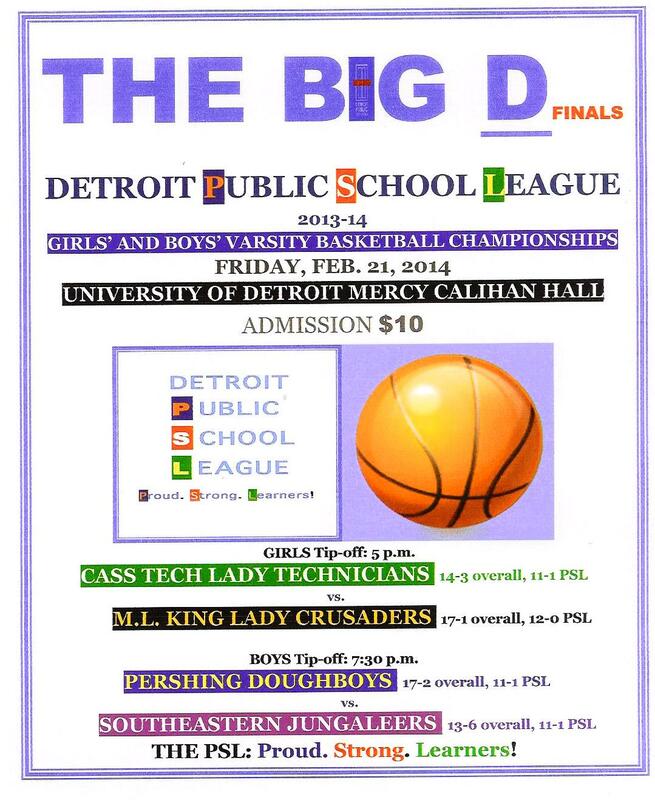 Pershing High’s Doughboys and King High’s Lady Crusaders will try to repeat as Detroit Public School League varsity boys’ and girls’ basketball champions Friday when the 2013-14 Big D tournament reaches its conclusion at the University of Detroit Mercy Calihan Hall. 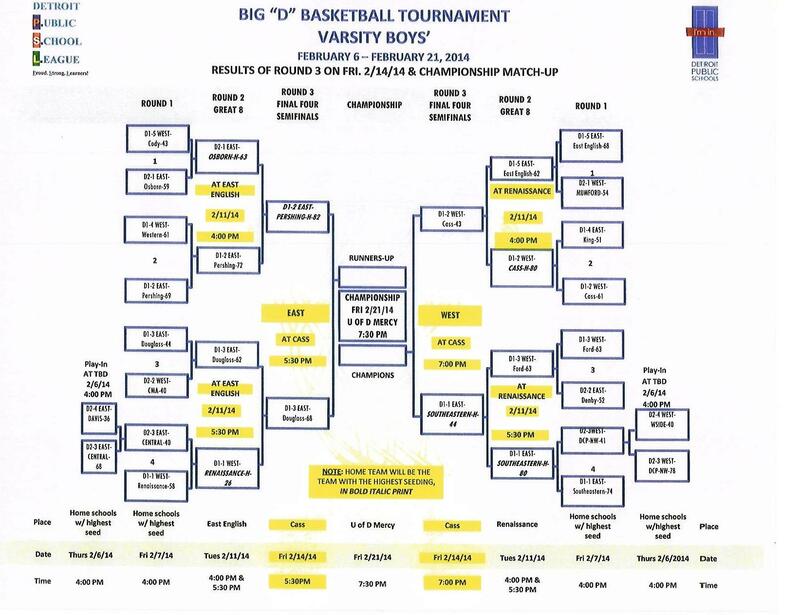 After two weeks of one-game knockout competition, the field has been eliminated to four teams. 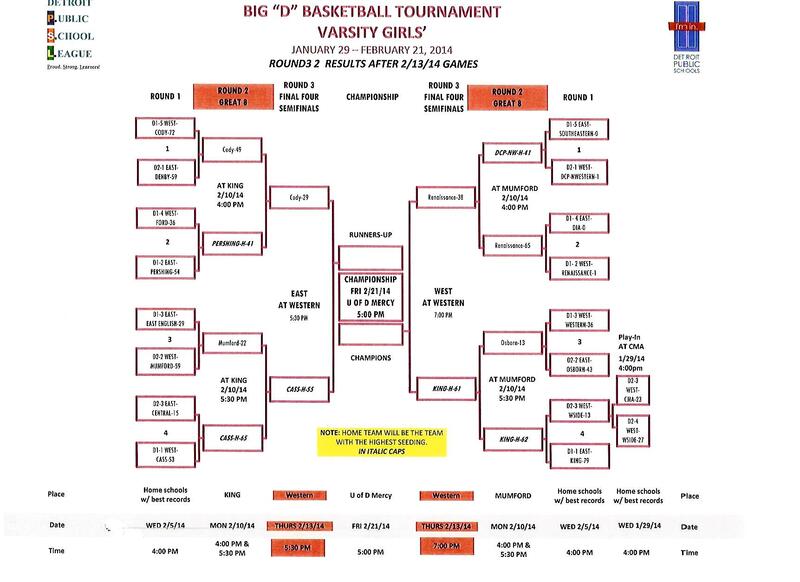 Friday’s championship doubleheader features King (12-0 league, 17-1 overall) against Cass Tech’s Lady Technicians (11-1 league, 14-3 overall) in the girls’ title game at 5 p.m., followed by Pershing (11-1 league, 17-2 overall) against Southeastern’s Jungaleers (11-1 league, 13-6 overall) in the 7:30 p.m. boys’ title game. Admission is $10 and tickets can be purchased in advance at the Calihan Hall box office Tuesday, Wednesday and Thursday from 9 a.m. until 5 p.m. and Friday from 9 a.m. until 3:30 p.m., then resuming at 4:15 p.m. when doors open. 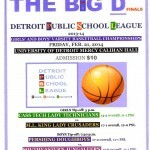 In last Friday’s Big D boys’ semifinals at Cass Tech High School, Pershing defeated Douglass 82-68, marking the second year in a row that Coach Wydell Henry’s Doughboys halted Coach Nkwane Young’s Hurricanes one game shy of the title game. In the other boys’ semifinal, it was déjà II. 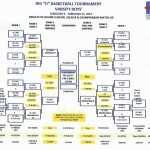 Last year, Cass Tech advanced to the PSL boys’ title game by beating Southeastern 61-60 on a tip-in at the buzzer. This time, Leonard Harper-Baker’s tip-in beat the clock to advance Coach George Ward’s Jungaleers past Coach David Dixon’s Technicians, 44-43. Pershing defeated Cass Tech in last year’s PSL boys’ title game, while Coach William Winfield’s Lady Crusaders turned back Cass Tech to win their second consecutive PSL girls’ title. Coach Marissa Thrower’s Lady Technicians are in the girls’ title game for the second year in a row. In their only meeting this season, Southeastern’s boys held on to deal Pershing its only league defeat 81-79, while King’s girls handed Cass Tech its lone league loss 58-36. In addition to the championship competition Friday, the PSL will introduce at halftime of each game its All-City girls’ and boys’ first team players as selected by the league’s head coaches (and listed below). Between games, there will be an on-court announcement of this year’s Mr. PSL and Miss PSL, an honor that goes respectively to the league’s top boy and top girl senior basketball player as selected by the head coaches and presented annually by the Horatio Williams Foundation. 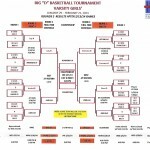 First team: Justin Tillman, Pershing; Darrell Davis, Douglass; Daryl Bigham,Southeastern; Leonard Harper-Baker, Southeastern; Mar’Qywell Jackson, East English Village; Second team: Kenneth Carpenter, Cass Tech; Justin Turner, Renaissance; Terrence Byrd, Mumford; Tyrone Acuff, King; Mory Diane, Pershing; Third team: Darsean Woodson, Pershing; Daavi Bradley, Douglass; James Towns, Ford; R’Zon Brown, Davis; Jermaine King, Osborn; Honorable mention: Terrell Hales, Douglass; Brailen Neely, Western; Marquel Ingram, Pershing; Jalen Freeman, CMA; Ketquan Gatewood, DCP-Northwestern; Leonard Askew, West Side. First team: Marte’ Grays, King; Siyeh Frazier, Renaissance; Jasmine Conner, DCP-Northwestern; Lauren Elliott, Cass Tech; Chelsea Harlan, Denby; Second team: K’Lynn Willis, Cass Tech; Tyra Jones, Cody; LaShai Geeter, King; Cache Poindexter, Mumford; Brittany Hill, Pershing; Third team: Taylor Parker, Cass Tech; Danielle Williams, Western; T’Asia Moore, Osborn; Tyara Green, CMA; Brianna Jones, DIA; Honorable mention: Micaela Kelly, King; Briana Priestly, Cass Tech; Zoey Oatis, Cass Tech; Sandra Boone, Osborn; Janae Williams, King; Icesis Chandler-Poole, DCP-Northwestern; De’Anna Fletcher, Mumford; Malasia Mason, East English Village; Erinasha Moore, East English; Cierra Walker, Mumford.